One of the few things worth getting up for on a drizzly, autumn Sunday morning is a teetering stack of thick, fluffy pancakes. These ones are beautifully light, and the addition of Ricotta gives them a cheesecake-like tang – the perfect backdrop to the jammy blackberry butter. Of course, you don't actually need maple syrup as well, but it's worth serving some on the side, just to make doubly sure there's no sneaking back to bed. First make the blackberry butter. Gently heat the berries, lemon juice and sugar in a small pan for 6-7 minutes until the blackberries soften and look slightly jammy. Allow to stand for 15 minutes; it will set as it cools. Whip the butter in a bowl with electric beaters until light and fluffy. Once the blackberry compote is cool, beat it into the butter so that it forms purple ripples. Refrigerate for 30 minutes. Preheat the oven to 170°C, gas mark 3. To make the pancakes, place the ricotta, milk and egg yolks in a mixing bowl and beat to combine. Add the flour, sugar, baking powder and a pinch of salt and fold in to make a smooth batter. In another bowl, beat the egg whites until they're softly peaking, then fold into the mixture. Heat the butter in a heavy-based frying pan over a medium heat and cook 3 x 7cm pancakes at a time for 1-2 minutes each side until golden and cooked through. As you make them, keep the pancakes warm on a baking tray in the oven. 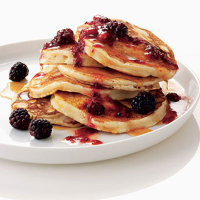 Serve with blackberry butter melting over the top; leave the maple syrup to your diners' discretion.